It's Our Spring Sales Event! We’re now taking reservations, don’t miss out! It's that time of year to get your backyard oasis construction scheduled so you can be swimming by summer. Lock in your price now and save before time runs out! Learn more about our sale, schedule a FREE consultation. Why build a pool now? Let’s be honest, it’s never that cold in Texas. Swim season lasts a long time in Texas, and don't forget about our amazing custom hot tubs. Most clients love enjoying their hot tubs during the winter months. 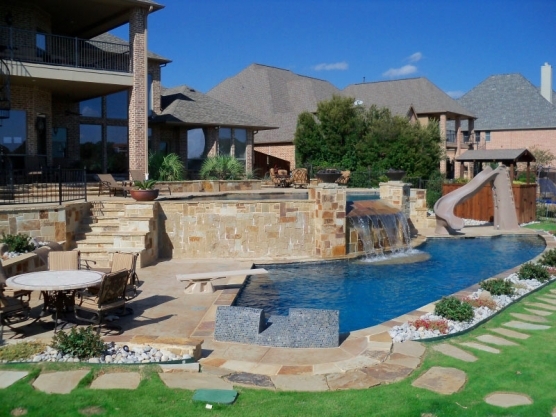 "Outdoor Living did a outstanding job in designing and constructing our pool, spa and built-in grill area. We were very happy with the overall experience and would highly recommend Lance to anyone looking to build a pool and outdoor area. Even after the construction process was complete, they have been very helpful with any questions we have had." "We were extremely happy with Lance and his team at Outdoor Living Pool and Patio as well as all the sub contractors that were used for our pool and spa project. Work crews were respectful of our property and worked diligently throughout the process. Best of all the project came in on budget and within the predicted timeline. We have really enjoyed our first swimming season and look forward to many more." "Outdoor Living Pool and Patio did a wonderful job!. They installed new equipment, tile, coping and plaster. We replaced the stone on the spa facade as well and added planters which completely updated the look of our pool. The entire project only took a couple weeks and they were wonderful at answering any of our questions after the job was completed. I would highly recommend Lance Hill and the entire team at Outdoor Living Pool and Patio.!" Request A Free Quote Today And Save!